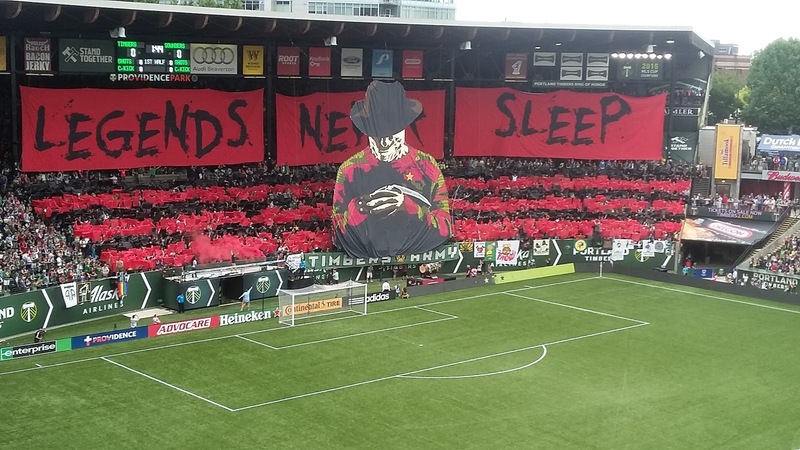 I can't wait for whatever tifo appears in this one. Records don't matter. Form doesn't matter. Nothing else matters during Cascadia Cup week, especially when it's the battle royale between the 2 American Cascadia sides. There have been several huge moments over the years when the Portland Timbers and Seattle Sounders FC meet up, especially since these teams have been battling since 1975 when the teams were part of the North American Soccer League. Starting that year, the Timbers defeated the Sounders in dramatic fashion at home in the first round of the playoffs, and things have exploded from there. From falling players, dramatic U.S. Open Cup matches in Portland, an epic meltdown at Starfire, a 2013 playoff upset and countless other moments, nothing is normal when these sides meet. Players come and go, and some have been on both sides of this rivalry as the teams moved from NASL to A-League to USL to now MLS, but the intensity and passion has never wavered. Not only are the two heated rivals getting ready to face each other at Century Link Field on May 27 in the first of their three battles in the regular season, the same 2 clubs will meet in the fourth round of this year's U.S. Open Cup at Starfire when MLS teams enter the tournament on June 13. In compressed fashion once again, the teams will battle 3 times within 30 days - May 27 up North followed by the U.S. Open Cup date, with the Sounders making their only Oregon visit in the regular season on June 25. The two teams will meet 1 more time at Century Link Field in August, but within that 30 day frame in late May and June, Portland will play seven matches over that timeframe with several huge opponents in that stretch - San Jose and FC Dallas at home, Colorado and Minnesota away - in the midst of playing the Sounders. Nothing about this will be easy, but honestly, nothing that is worth it ever is. As our crack staff of prognosticators looks at this matchup, which will be available nationwide on a broadcast on the FOX network, we only know a few absolutes - Diego Chara is unavailable due to suspension for a red card he received versus Montreal, Portland is reasonably healthy otherwise and their other key weapons are available, and the last 2 MLS Cup Champions will likely put on quite a show with someone completely unexpected stepping up to influence the outcome. The Timbers have never won at the Clink and have a record of W0 D2 L6 F4 A14. The suspended midfielder Diego Chara will be missed as the Timbers aim to stop leaking goals and getting their attack ticking again. Scorers: Valeri for us. Dempsey for them. The ninja cat has predicted track meets for the past few weeks, and she is sticking with her theme with lots of meows and eeps. We were struggling to keep track of the numbers, but it came out with the green guys getting their first win up North. When I asked her if it was about time, she flopped over and started purring. It appears the young tortoise shell is feeling confident about this one. 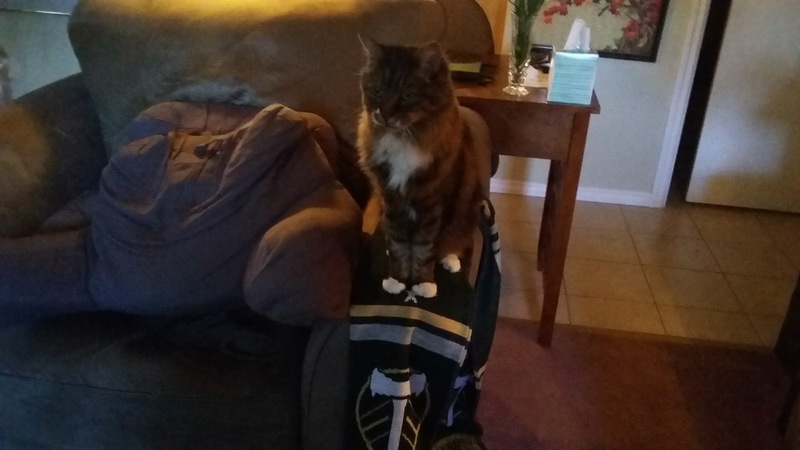 The queen sits with the MLS Championship scarf. The queen of the scoreless draw once again decided that neither team would get any goals this weekend, thus allowing both sides to earn a point for their troubles. This picture was after 10 minutes of coaxing, but once she figured out the scarf was soft, it was difficult to get it away from her. But getting her to provide some type of score was again an afterthought. GB is very stuck in with his teams. The gray boy was rather animated during his interview about what will happen this weekend, as his tail was thumping throughout the entire process. He was rather emphatic that something physical will happen during the match, but the person would not receive a red card - but he wasn't specific about which team would be the instigator. We know what teams he likes though, but he is calling for the draw. I still have all the scarves. Do I really need a better reason than we always win 2 to 1? 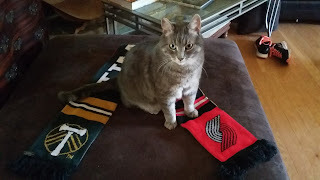 Well, despite the history up North in terms of results and goals allowed and Portland's recent run of bad fortune, I think the team is fired up and going to break the streak finally. Fanendo Adi loves playing these guys, and I'm calling for him to get the brace in this one, but the defense will be unable to hold the clean sheet. However, it will be enough for the Timbers to break their road woes. All you, Kip. Make it happen! 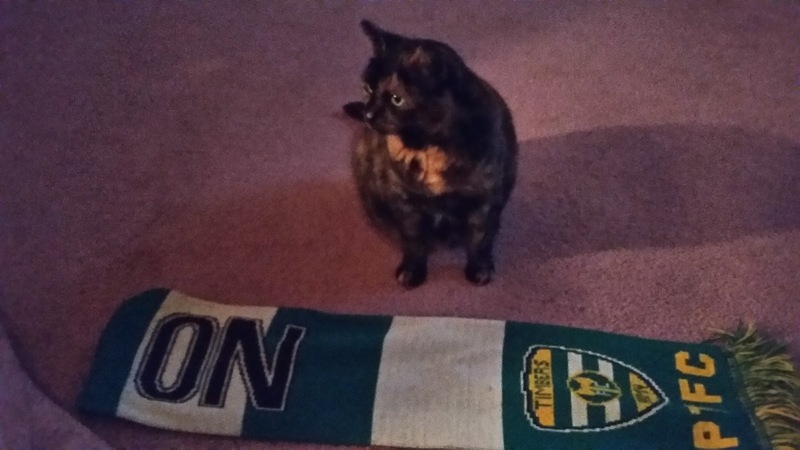 Tortie called for a win, but there might not be 21 goals in the match. She was pretty confident about lots of goals though, so we shall see.